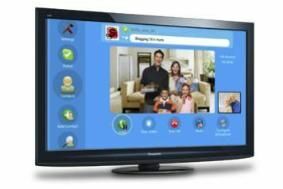 CES 2010: Panasonic adds Skype to 2010 Viera TVs | What Hi-Fi? It will allow free Skype-to-Skype voice and video calls, low-cost calls to landlines and mobiles, the ability to receive calls via an online Skype number and Skype voicemail. The camera will be capable of delivering 720p video, subject to internet bandwidth, and has a microphone specially designed to give clear speech from 'couch distance'.